Known as the Queen City, Charlotte is located in Mecklenburg County which is the largest county in the state. This area is located within the Piedmont region of the Carolinas, which is two hours east of the Blue Ridge Mountains and three hours west of the North Carolina coast. Mecklenburg County is also centrally located on the east coast between Maine and Florida and is easily accessible by four major interstates: I-85, I-77, I-277 and I-485. This strategic location has been a key factor in why so many businesses and residents chosen to make this area their home. Charlotte is the 19th largest city in the U.S. with nearly 800,000 residents making it the largest city in the region and Mecklenburg County has a population of nearly 1 million people. With over 7.1 million residents in a 100 mile radius, Charlotte has become one of the largest urban areas in the United States. 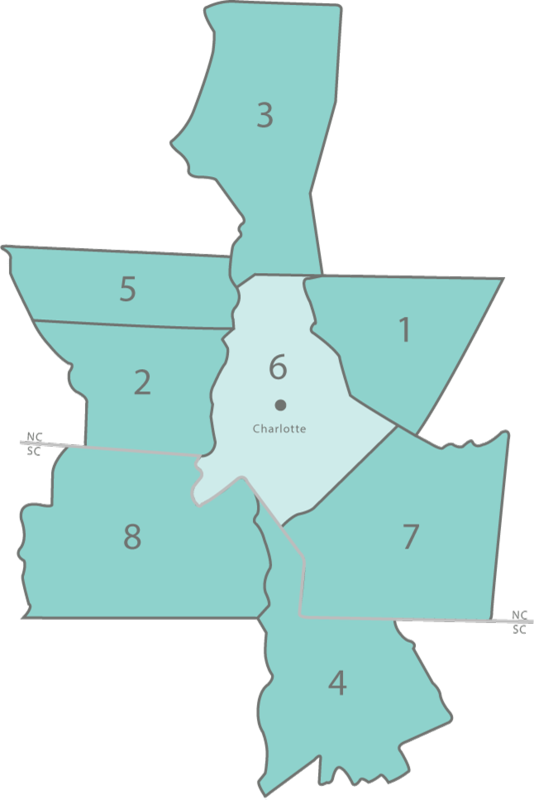 Mecklenburg County has seven municipalities including the Charlotte (county seat), Cornelius, Davidson, Huntersville, Matthews, Mint Hill, and Pineville. Charlotte has a tremendous pro-business environment and is one of the fastest growing metropolitan areas in the country. It has also become a financial, distribution and transportation center for the entire region and is headquarters to many national and international companies. In fact, Charlotte is the 2nd largest banking and financial center in the U.S. Nine Fortune 500 companies with headquarters in the Charlotte region including: Bank of America, Lowe’s (Mooresville), Nucor, Duke Energy, Sealed Air Corp, Sonic Automotive, Family Dollar, SPX Corporation, and Domtar (Fort Mill, SC). In addition, over 325 of Fortune’s top 500 companies have one or more facilities in Mecklenburg County. The region is also a major manufacturing force with over 1,800 manufacturers representing all sectors and comprises the largest concentration of manufacturing plants in the Carolinas. The growing number of international companies is of great importance to the area and over 850 foreign-owned companies have Charlotte area facilities. Mecklenburg County is also home to Charlotte Douglas International Airport, which is the 8th busiest airport in the country and offers over 700 daily flights including 155 non-stop domestic and international flights. In addition, public transportation includes the Lynx commuter light rail line that runs from I-485 at South Boulevard to Uptown with expansion plans in the works. The Charlotte Area Transit System (CATS) buses offer over 70 local, regional and express routes and Amtrak provides train transportation to New York, Raleigh and New Orleans and all stops in between. Charlotte even has a Charlotte Trolley system with vintage streetcars and is a fun way to get around or explore Uptown. The Charlotte region has a mild year-round climate with an average of 218 sunny days and an average rainfall of 45 inches per year. Residents enjoy a spectacular display of foliage throughout all four seasons. Spring and fall are a favorite among residents and visitors with average temperatures in the mid-70s. Our winters are short and mild and, though we have an occasional snowfall, severe winter weather is rare. The Charlotte-Mecklenburg school system is the second largest in the Carolinas and one of the largest employers in the county. There are a growing number of independent, private and charter schools. In addition, the Charlotte region has 35 colleges and universities including the Central Piedmont Community College, which is the state’s largest community college, and Johnson and Wales University, a premier culinary school. Charlotte has a nationally renowned healthcare center with 12 major hospitals in the Charlotte region representing two major healthcare systems: Carolinas HealthCare System operates eight hospitals including the renowned Levine Children’s Hospital and Novant Health operates four regional hospitals. When it comes to professional sports, the Charlotte region is home to the NFL’s Carolina Panthers and the NBA’s Charlotte Hornets. Semi-professional sports are also well-represented by the Charlotte Checkers minor league hockey, Charlotte Knights AAA baseball, Charlotte Hounds lacrosse, and Charlotte Eagles (men and women’s) soccer teams. Each spring, golf fans enjoy the PGA’s Wells Fargo Championship and we are also proud to have the U.S. National Whitewater Center, a world-class training and sports adventure center. Professional motorsports are especially popular to the region and Charlotte is home to the NASCAR Hall of Fame and Museum. Each year, hundreds of thousands of fans cheer on their favorite drivers at Charlotte Motor Speedway in nearby Concord which is the largest sports facility in the southeast and has set the standard for racing for the past 50 years. Over three quarters of the NASCAR industry’s race teams, employees and drivers live nearby. The superb quality of life is one of the main reasons why Charlotte has been named one of the Best Places to Live in the United States. There are thousands of options for shopping, dining, performing and cultural arts, museums, art galleries, music venues, live entertainment, and indoor and outdoor recreation including hundreds of miles of walking and biking trails, sailing, waterskiing, fishing, or boating on Lake Norman, Lake Wylie and Mountain Island Lake. The quieter side to Mecklenburg County is home to hundreds of churches with every religious denomination represented. There are so many reasons why residents choose to make Charlotte their home. Whether you prefer golf course or lake communities, urban or suburban living, historical homes, art communities, or swim and tennis neighborhoods ~ HM Properties will help you find the home to best suit your lifestyle. We look forward to working with you! Lake Wylie (8,841) - Based in York County, SC, Lake Wylie also has shores along Mecklenburg and Gaston counties. Lake Norman (7,411) - Shores in Mecklenburg, Iredell, Lincoln and Catawba counties.